Tuberculosis is a highly contagious and, unfortunately, frequently fatal aquarium fish disease. This disease is also one of the few diseases that can be transmitted to humans through contact with open wounds or sores. The symptoms of this disease typically include loss of appetite, frayed fins, white blotches on the skin and a sunken stomach. Affected fish may also display behavioral changes, appearing listless and or lethargic. As soon as you suspect that one of your cichlids has contracted this disease, remove all other fish to a hospital tank and treat the tank. You will also need to thoroughly clean and disinfect the original tank before you add the fish back to the tank. 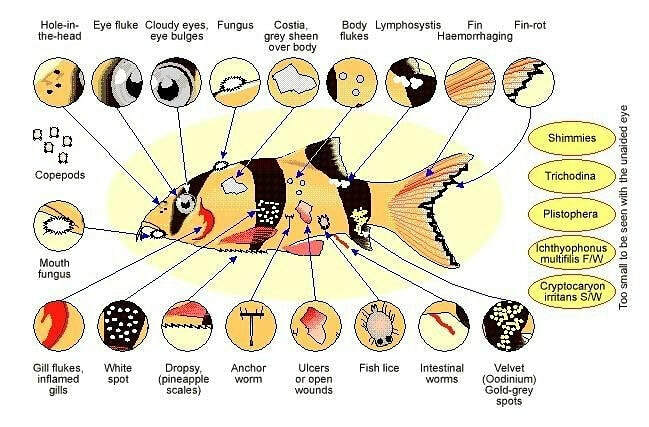 This disease is caused by a parasitic flatworm which infects the gills of fish – hence the name of the disease. Once the parasite has been introduced to the fish, it will attack the gill membranes, causing them to redden and acquire a thick coat of slime. This slime makes it difficult for the fish to breathe, so you may see symptoms such as the fish gasping at the tank’s surface or rubbing its body against tank objects. Other symptoms of this disease may include fading color and labored breathing. TREATMENT: Salt dosage of about 1 tbsp. per day accompanied by a slight increase in tank temperature. Cotton wool disease is a fairly easy condition to diagnose because it manifests in the form of fuzzy white growths on the head, fins and scales of infected cichlids. This disease is caused by a fungus that is naturally found in the aquarium but only becomes a problem in cases of poor water quality. 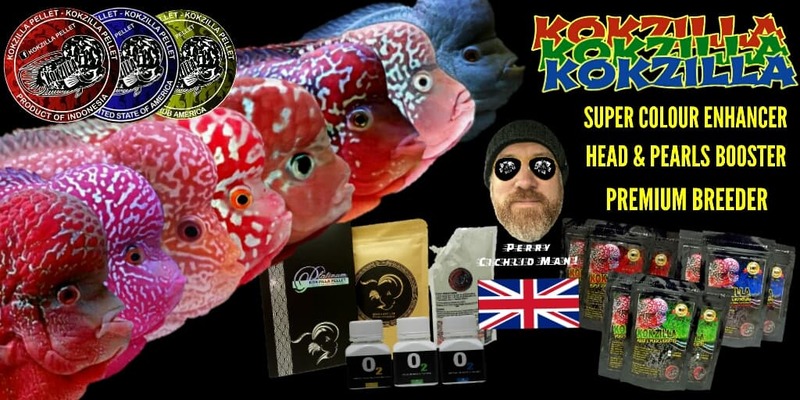 When uneaten fish food and other organic debris accumulates in the tank and the water quality declines, fish are more likely to succumb to fungal infections like cotton wool disease. Stress and prior injury may also increase the susceptibility of cichlids to fungal infections. TREATMENT: Antifungal medication or a salt bath. Malawi bloat is a type of aquarium fish disease that is most common among African cichlids. This disease manifests in the form of symptoms such as swelling in the abdomen, rapid breathing, loss of appetite, discolored feces and lolling at the bottom of the tank. In addition to these symptoms, Malawi bloat can also lead to liver and kidney damage if left untreated. Once the disease progresses to this point, it is typically fatal within three days. Unfortunately, the cause of this disease is highly disputed – some maintain that it is caused by a protozoan that lives in the intestines of cichlids. When the water quality in the tank declines and the fish becomes stressed, the protozoans reproduce and begin to cause problems. This disease is caused by a protozoan parasite called Ichthyophthirius multifiliis – the disease itself is called Ich, for short. Ich is fairly easy to identify because it manifests in the form of small white dots on the fins, gills and body of infected fish. 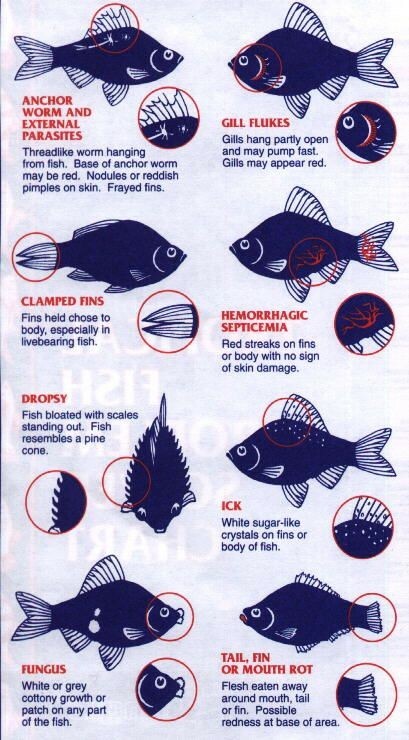 Though these spots are the most obvious sign, other symptoms of the disease may include clamped fins, labored breathing, lethargy, loss of appetite and rubbing against tank objects. Ich is a highly infectious disease so, if you see white spots on one fish it is likely that the others in the tank have already been exposed. For this reason, it is typically better to treat the whole tank rather than quarantining the infected fish. TREATMENT: Salt baths, increased tank temperature, potassium permanganate, malachite green and acriflavine.